A well-fragranced home is an important thing in my book. A scented candle can create a pleasing olfactory ambience for when friends are over for dinner, whilst a room spray can provide scented refreshment to stale air and cover up unpleasant pet or cooking odours. Then there’s the reed diffuser, now these are interesting. I’ve always looked at reed diffusers as the background noise of home fragrance – they provide a fragrant hum in the background, adding a more subtle ambience to a room. These three methods of home fragrance – the candles, room sprays and reed diffusers – can be used together, of course, to compliment and contrast, but it is the reed diffuser that makes for the perfect base layer in one’s home fragrance arsenal. 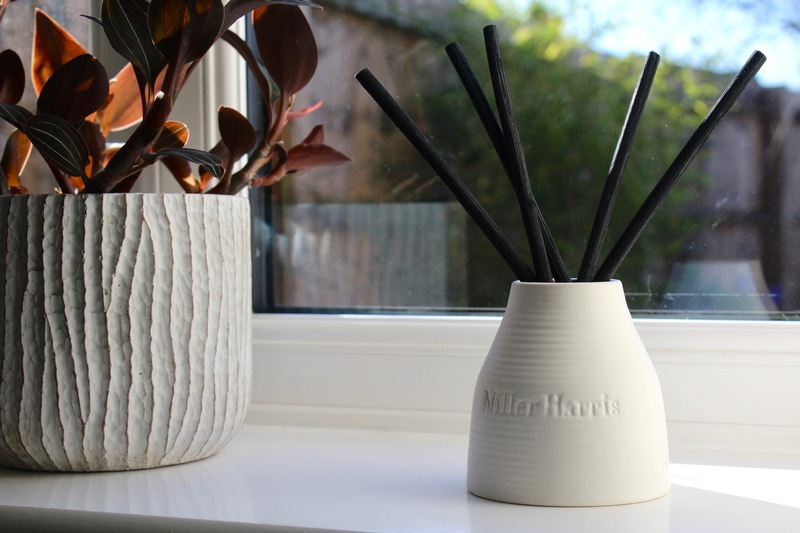 I am guilty of being both a home fragrance lover and a Miller Harris fanboy, so it was no surprise that when the brand launched their dedicated collection of home fragrances, I was most intrigued. The crown jewel of this collection, which features room sprays (one of which is an aquatic oriental called ‘Periwinkle’ that I must have) to compliment their existing series of candles, is the ceramic reed diffusers. Available in four fragrances (Cadimus – a tuberose, Narcoflor – a huge floral bouquet, Verditer – an ode to figs, and Mossket – an earthy chypre), these diffusers are as much an enviable decorative object as they are a vessel of beautiful fragrance. I was sent Narcoflor to try and it’s officially a Candy Crush! Instead of a Christmas gift guide this year, I’m switching out my regular Candy Crush posts for just as regular Christmas Crushes instead. In these posts over the coming weeks you’ll find some wonderfully scented gifts just in time for the holiday season, with products that I am crushing on. So get ready for some marvellous Christmas gift inspiration! Gosh, I’ve been reviewing so many candles recently you might as well call me ‘The Candle Perfume Boy’ (hold for applause). OK, terrible puns aside, I very much enjoy a scented candle so it was imperative that I brought you a selection for one of my Christmas Crush gift guides – nay, not a selection, an extravaganza! So that’s exactly what this is, a round-up of some beautiful scented candles that make lovely Christmas gifts for those languishing on your ‘to buy’ list (hurry up folks, because you don’t have many shopping days left). Some are evocative of the festive season and some aren’t, but all smell fabulous, making perfect gifts for the house proud or those that simply love a scented candle like me! The theme at Penhaligon’s this season is ‘Christmas is in the Air’ and with this Christmassy concept they are mixing the two things that make their identity so unique: tradition and eccentricity. Their golden packaging is accented by beautiful red ribbons, with what appears to be a rather traditional, Victorian scene as the illustration. Look closer though, and the signature quirk of Penhaligon’s is revealed! Carriages driven by birds and flying clocks lead one to remember that the world of Penhaligon’s is a topsy turvy one, and that’s what makes it so wonderful to explore! This Christmas, Penhaligon’s have curated a fine selection of gifts for any of those eccentric beauties in your life. There’s perfume aplenty, with gorgeous sets and mini-collections amongst their expansive collection of scent. There’s even a special home fragrance for this year, not to mention many other quirky things to love. So in this extravaganza of a Christmas Crush post I’m brining you a veritable feast of Penhaligon’s gifts to hopefully inspire your present-buying this holiday season. With any luck we’ll have ticked some people off your gift list by the end of the post no problem. Looking for some inspiration to scent your home this Christmas? Check out my latest Escentual for some beautiful home fragrance (featuring Acqua di Parma, Comme des Garçons & Annick Goutal) to enhance your Christmas decorations. Click here to read. I have struggled with my mental health. I’ve always been an anxious person and for the longest time I just thought the level of nerves I felt was normal. I mean everybody gets nervous before speaking publically or attending interviews, right? But it wasn’t just those situations that made me feel nervous – sometimes it would be paying for something in a shop or talking to somebody I didn’t know. At my worst it was any interaction with another human, even with people I knew. Luckily for me I was able to seek help and remove myself from the situations that exacerbated my anxiety. I now have mechanisms in place help to deal with anxiety and for the most part, I am a happy person. Because of this I am very lucky. Cire Trudon is not a conventional house of home fragrance. They do not, like many brands, create candles that represent one smell, like rose or oud, or even combinations of such notes. No, Cire Trudon tell stories through wax, smoke and glass. They are a brand that allow you to fill your home with the scent of the cold stone walls from a Carmelite convent or fresh mint from the mountains of ancient tribes. Cire Trudon are not a typical brand and their many scented offerings are anything but ordinary, in fact they are rather extraordinary! This Spring, Cire Trudon have twisted their narrative ever so slightly with their Les Belles Matières collection. Starting with three scented candles, which are housed in the most eye-catching of blue jars, Cire Trudon promise a “geographic odyssey” with this new collection, which takes one on a journey to three exotic destinations by way of iconic ingredients, covering not only a number of air miles but also three of the most familiar olfactory genres: florals, woods and fruits. The three scents are Tadine (New-Caledonia by way of sandalwood), Reggio (Calabria via citrus) and Maduraï, the focus of today’s review, which is all about “the splendour of Indian Jasmine”. I’ve never been to India but you don’t have to do much convincing to get me on board with a white floral so the prospect of an jasmine sambac by the bucket load is an easy sell. Maduraï tells the tale of the flower’s many uses, whether they be in tea, as floral garlands or in perfumery. Maduraï is an ode to jasmine in its full glory and unexpectedly, it’s rather glorious.